Anyone who has a normal fear of heights has little to worry about on the Tour du Mont Blanc unless it is a crippling fear. There are a few short drops, but nowhere are there big cliffs or exposure. It is a summer hiking route and the trails are well-maintained. There are some sections when it is bit steep – with ascent or descent – but they are not to worry about. If you have a serious fear of heights, it might be worth considering a different trek. However, at Salamander Adventures, we organise guided tours led by highly experienced guides who are able to help people who may have a normal fear of heights. There are some fixed ladders on the Tour du Mont Blanc. These are placed at the beginning of the summer season by the local Guides Office and help hikers ascend or descend small sections which are regarded as steep. 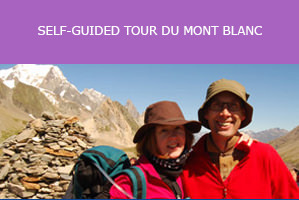 These are only above the Chamonix Valley and not found at any other part of the normal TMB route. Above Chamonix, there is one small ladder – about 12 feet high – on the descent from Lac Blanc to Argentiere. If you have a serious fear of heights, the Hiking Guide could rope you up for security. Alternatively, there is a rocky gully near this ladder than means you can bypass the ladder. 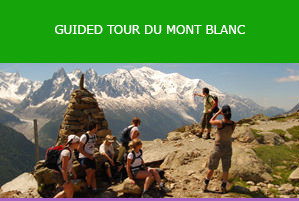 Most people walking the Tour du Mont Blanc between Chamonix and Argentiere will take the path via Lac Blanc and on to the Col des Montets. This is a normal hiking path. However, there is an alternative route that takes in a series of ladders that link Argentiere to the Tete aux Vent on the way to Lac Blanc. These ladders are immediately above the Aiguillette d’Argentiere: there a quite a few of them with some exposure, but perfectly OK for anyone who doesn’t mind heights. The tallest ladder is around 25 feet high. These ladders are best used for going up to Lac Blanc. It is much more difficult to use them on the descent and so best avoided.